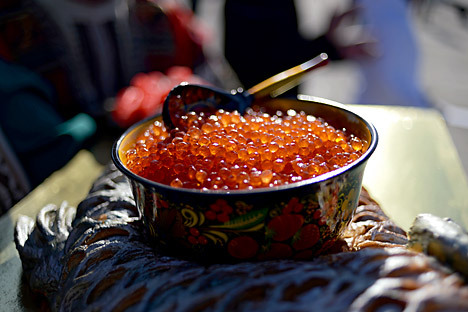 While black caviar may have the higher price tag, Russia red caviar is still a savoured delicacy. Coho salmon, also known as silver salmon or white fish and named for the bright silver colour of its scales, provides the most expensive caviar. It is considered as the best, and its colour is bright red. Coho salmon is a fish that is also known in America (it is found also in Alaska) and is not bred in captivity, because Coho salmon die after spawning. In some places, the natives still go fishing with a bucket or simply pull out the fish with their hands – as much as they need. It is clear that in these regions, red caviar is not quite the delicacy that it becomes after travelling thousands of kilometres to the west.